Reviewing my Facebook timeline this morning, I’m struck by how the attacks on Paris have made us, or revealed how we already are, so very defensive and divisive in our default mechanism of thinking today. Many liberal people are offended at others’ comments about feeling wounded by Paris having been attacked because to them, mourning the events in Paris prioritizes another big western nation and diminishes similar ongoing attacks in other countries. Given the nature of most of my friends, I’m thankfully not seeing Islamophobic remarks…but I am seeing a lot of preemptive commentaries, obviously borne from a fear of what might happen, defending Muslim people and cautioning against taking these attacks as an assault from people of the Muslim faith. Many people (thankfully not my friends, but pundits and politicos everywhere) are using the attacks as opportune support for their arguments about further escalating our involvement with middle eastern conflicts, or by making comparisons to domestic gun laws. It’s all a lot to take in. Everyone is hurt, but some seem to be personally distraught and others seem to be riding along a bandwagon that has HURT craftily branded on its side. This blanketed my Facebook wall this morning. It is Paris that we should pray for today. The lives lost, the crimes against a rare culture that often exaggerates the most compelling and unique aspects of human nature. Let’s not become so partisan that we feel compelled to generalize everything into a greater social agenda. When New York City was attacked in 2001, people didn’t say “let’s not mourn for New York because people are dying everywhere.” The few who did, we called our enemies. Seeing Paris attacked is upsetting to me because of what the city (to me) represents–something exceptional in our modern culture, a city that still values art and the human spirit. New York, DC, London, et al. house arts and creative enterprises but are driven in my observation by commerce, with the arts operating as capital investments; my lifelong association with Paris has been different, and my short visit there made me feel, to my surprise, as if the Parisian culture really is an exception to much of the rest of the capitalist world. That the city and its people, with many obvious exceptions, really do experience a joie de vivre, an appreciation for daily life and sensuality in its rounded meaning, that I never see among American people except when we are on vacations–when we give ourselves permission to experience a short-lived fantasy life of not existing solely as human capital with a drive to “succeed” by way of being part of a great national economic engine. I don’t expect this is everyone’s perception, but it is mine. So I think it’s OK to feel especially bruised by an attack on a city with which the United States historically has had an unusual relationship; for me, the city represents both a cultural ideal for what our country could be, and also a nation with a history very different from that of ours, having gone through many incarnations due to revolts and instability from both inside and outside its borders. It’s only my opinion and I am as biased as anyone else, but I feel like many of us in this country have an idealized association of Paris–and as is rarely the case, I think some of that association is actually justified–so such a big hit on such an idealized nation is a surprise. Literally every day I think about our country unfairly using flying robots to drop explosives in neighborhoods throughout the Middle East and feel guilty about it and feel like doing this could only antagonize a great number of everyday people into hating us. If your family’s minivan were blown up by a rocket fired from unmanned aircraft from another country–one of many that does this at random almost every day–how could you not resent that country? I am conscious of our involvement in global conflicts, not only our looking the other way when ISIS/ISIL attacks throughout the Middle East, or especially looking the other way when countries that we’ve arbitrarily decided are on our team despite committing violent crimes against their own people, but also when we do. It’s upsetting and every day it makes me lose faith in the idea that this country represents liberty; dropping explosives from remote-controlled drones abroad makes us a bully unlike any other and isn’t a justifiable way to preserve our freedom as the result of a single attack on our own soil. According to this 2014 article, the US at that time had targeted 41 specific men with their drone strikes–and killed 1,147 people, including children and women. In military terms, collateral damage; in human terms, that’s a lot of unjustified murder of innocent people–Muslim or not, Islamic or not, totally irrelevant when speaking in terms of life and death. Yes, I know ISIL/ISIS, the Taliban and other terrorist organizations are murdering people, they say, in the name of Allah. But in whose name are we murdering people? Freedom? That’s hard to stomach. I think we can be generally aware of what violence is being committed against communities and individuals throughout the world–and when we do so, we must acknowledge that despite growing terrorist organizations’ power, our country must represent next-level oppression to many because of the numbers of people who we kill all the time in other countries in our efforts to keep them from sending violence here–and at the same time feel particularly upset about just the idea of Paris being attacked. 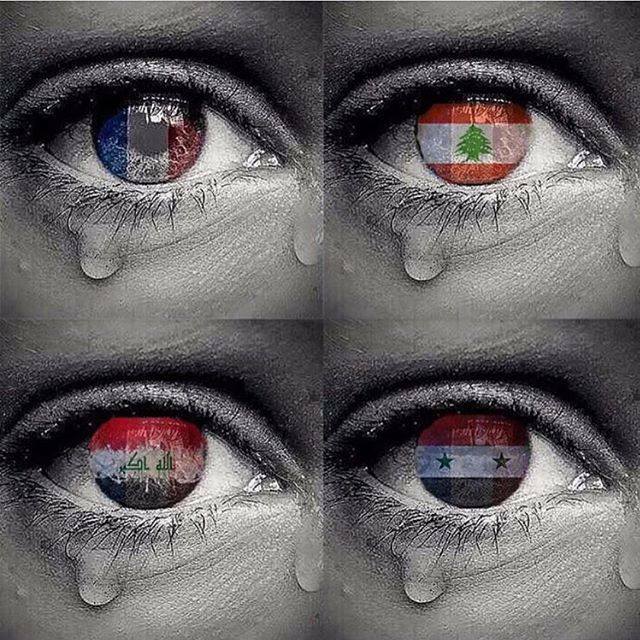 The deaths of Parisians are no more and no less important than deaths of violent acts committed in any nation. We shouldn’t be irate that so much attention is being paid to Paris–a city with which the United States has a long and inextricable bond. We should take advantage of the increased awareness that these things are happening throughout the world, and we should address these things in a different way than we do. News coverage is largely dedicated to moment-by-moment tracking of growing body counts, and showing gruesome and disturbing photos of injured and dead people. We should be discussing instead how these things come to happen, and how to prevent future incidents. But if we are going to have a real discussion about these things, we are going to have to acknowledge our own role in cultivating those who hate us. Might some would-be terrorists be created by our own actions, dropping bombs regularly from unmanned aircraft and never addressing casualties in our own media, and never discussing our own acts of violence against other nations in polite conversation? There will be no resolution if only half the story is ever told. And it’s jarring to me that liberal-minded people, especially, are saying they are “offended” that so much sympathy is being given to Paris when other areas are being terrorized, as well. If we have to play partisan politics, then liberal people should recall that when our country–for reasons never justified–decided to wage a war that we didn’t call a war on the people of Iraq, France refused to join in the unjustified attack. As a result, conservative members of congress childishly replaced all things French with “freedom”–remember freedom fries?–to shame the nation for not joining in our peacekeeping invasion that, in a typical Orwellian paradox, has killed thousands of innocent people. It turns out France was right and we were wrong. That our leaders ridiculed them for wanting to practice peace rather than kill people in the name of it as we have done is reason enough to mourn what an attack on Paris represents. As with everything in life, the truth behind every faceted side of these conflicts is complex and many-layered, which means emotions will be likewise conflicted. We should be able to express how we feel and have useful discourse rather than automatically condemning other people based on our assumptions that they are either islamophobes or anti-American. The truth is that a person can be both or neither at once. And a person can be both at once, perhaps because it’s starting to feel as if there are no good-natured people left in the world. No one who listens without hearing the words she already has assigned to you in her head–the view that directly opposes hers because it doesn’t identically match hers. Thinking doesn’t mean choosing the side that you think represents thinkers and restating their collective opinions. Thinking involves, first, listening to other people and understanding that facts are assigned realities that often change, whereas individuals’ emotions are both pure and real while they are being felt. If they are hateful, they are likely rooted in extreme fear and a desire to belong to a group of people with like minds. If they are too loving, they still may not be listening because they want an idealized form of peace that discounts the ugly reality of human emotions; they’ll go with the team that they think represents goodness–but in reality is the mirror’s equal and opposite resistance to listening. 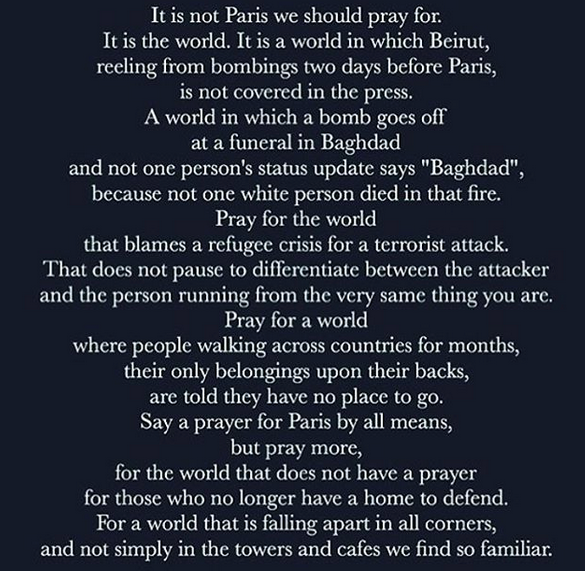 I was tempted to repost the “we shouldn’t pray for Paris–we should pray for the world” graphic that draws attention to other areas being terrorized. I read it and agree with the sentiment, except that it unkindly and inhumanely denigrates the assault on Paris and its people–the result of today’s tendency toward groupthinking and a with-us-or-against-us mentality. I don’t like team sports, I think, because choosing a team has always felt entirely arbitrary to me; I am supposed to be emotionally involved with the Redskins because the team is geographically closer to me than any other? And I’m supposed to defend its outdated name and become so rapt by participating in the collective emotional experience of the crowds that I scream and stomp my feet and roar and throw things at the TV because…it’s what you do? When I see people act this way, from my eyes I see how easy it is to whip masses of people into a mad, unthinking frenzy of emotion based on something as hollow as a simple mascot and brand name, with people self-segregated in clans of “fans” and self-recognizing by wearing their team colors–little different than ultra-patriotic Germans many of whom who were so blinded they marched proudly into atrocities none of them ever would have believed they’d participate in. And yet they did. If we listen to one another’s opinions, and talk about them instead of erecting walls (Mr. Trump) to cut “the other” out of our lives, then we may be able to defuse some of the anger and aggression and the hurt and fears of being hurt or ostracized that they are rooted in. Just a long soapbox ramble of the sort that’s on my mind when I wake up at 4 am and see a virtual wall of fear and vitriol, opinions divided evenly into “destroy the enemy” and “you’re the enemy if you react incorrectly.” Emotions are the most powerful thing in the world–they’re behind the building of the atom bomb, getting us to the moon and Mars, caring for children–and can’t be muted by choosing the “right” side. They can be depressurized by listening, discussing, and debating with the understanding that different opinions are based in different experiences that yield different emotional responses. The truth is complicated and hard to swallow. Those of us who are part of this seemingly peaceful country are safe at home and arguing over whether Islamic terrorists have waged war on us and must be destroyed or whether people who practice Islam are being maligned by extremist fanatics who don’t represent their cultures. The line has been drawn cleanly in the sand, and we as Americans are expected to choose our side. That makes it easy, then, to make that decision and then look outward beyond our own boundaries. A massive attack was waged by someone on US soil almost 15 years ago and it left us traumatized with thousands of people killed by the hands of a small group of terrorists. Over the past 10 years, the US has shot over 400 missiles into the soil of Pakistan alone. If we can set aside the fear of the implications of what that means for us as a nation that we believe stands for peace and freedom, considering it could make for some useful conversations–necessarily loaded with emotion. The news media like to give us updated tallies of dead bodies, but where is the useful conversation in this? What do we really want? To be right? To win? To assimilate others to thinking the way we do? If so, maybe that’s the problem–it’s what everyone wants. One of the aspects I was taught about French culture that always has magnetized me to it is that the French notoriously like to argue, to debate, and see everything in terms of free-flowing metaphors. In my mind, head-to-head battles of words over coffee or wine represent a more peaceful and dynamic form of human nature than one wall of uniformed and armed men facing down a wall of different-uniformed men, each programmed to think, collectively, that they know what’s right and are willing to die for it. Why not live instead and stop broadcasting mass casualties and buying into the temptation to want more? While there are exceptions, it’s really hard to hate and want to kill the people with whom you are arguing, if you’re actually listening to what they have to say.